In an instant, his world flipped 180 degrees. My son transformed from serene and peaceful to boiling rage. My mouth collapsed to the concrete as I stood in the parking lot of my daughter’s preschool. His voice thundered. His eyes intensified. His face turned crimson red. On the outside I was fighting to stay calm, but on the inside I was terrified. His anger explosions seem to come out of the blue. Of course, being late to pick up my daughter and feeling like other parents were intensely staring me down wasn’t helping any. The hidden meaning behind angry and aggressive behaviors. In short, kids are fighting desperately to matter. Anger and aggression is often a missed communication about what the child wants not mattering, which to a child equates to not mattering as a person. When unheard upsets build, kids will turn to aggressive and challenging behaviors to show you instead. Those behaviors can be seen as a cry for help. Things can worsen quickly if missed communications build over time. When parents or caregivers try to stop or scare kids out of angry and aggressive behavior, kids may try to prove that their upsets are very real by further escalating their behaviors. 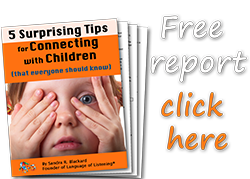 Help your child step out of angry and aggressive behavior. This is why Language of Listening®, the 3-part parenting framework that I use, is so useful. Because even when you’re eyeballs deep in a stressful parenting situation, you’ll know how to respond to your kids. The first part of Language of Listening is almost always SAY WHAT YOU SEE®, which means you describe the situation without any judgement, questions, teaching or fixing. This immediately re-connects you with your child and gets you on the same side. When helping a child struggling with anger and aggression, getting on the same side is paramount. 3. SAY what your child's body is doing. Getting on your child’s side is the first step towards facilitating anger in a healthy way. The more you can “match or mirror” your child’s intensity and facial expressions in a genuine way, the faster they know you understand. Once kids reach the point of anger and aggression, it’s all about meeting a need for power. In order for your child to calm down, this need absolutely must be met in some way. This is why kids' anger will intensify or explode again later if they aren’t allowed to first express their feelings and second meet their need for power. The simplest way to meet an angry child’s need for power is to offer a way they CAN express their anger and aggression. This is the CAN DO part of Language of Listening. Rather than capping your child’s anger, which will just build and explode again later, you are helping him or her release aggression without hurting others or themselves. The sooner you can help your child discover a safe outlet, the quicker they can meet their need for power and calm themselves down. Your child could rip paper or boxes. Or kids could scream into a cushion. If you’re out in public, head outside to the car and scream in the car. 3. Turn the problem-solving over to the child. Dive into "Success Training" once everyone is calm. Success Training will help your child discover his or her inner greatness. Every child is capable of controlling their emotional expressions; it’s only a matter of helping them recognize it. This is the STRENGTHS part of Language of Listening where you can help your child see what they did right in a situation and apply it to future situations. This is the moment that fueled his anger. And at first glance, my brain told me say, “Oh stop it. It’s just a silly book. You can have it again in 5 minutes.” But I knew that using Language of Listening instead of logical explanations would be quicker in the long run. No matter your child’s ability or age, it’s simple to implement Language of Listening. More than anything, we all want to feel heard and understood. Anger and aggression is simply a way that kids communicate to show you instead of telling you. 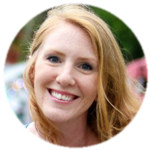 Lauren Tamm is a licensed Language of Listening® coach and the author of The Military Wife and Mom blog where she writes on practical parenting, enjoying motherhood, and thriving through the ups and downs of military life. Connect with her on Facebook or Pinterest.